NEW YORK -- Right there," he says. "It happened right there." Chazz Palminteri is pointing to a spot on East 187th Street in the Bronx a few yards down from its intersection with Cambreleng Avenue. It was there, back in the early '60s, that a neighborhood wise guy gunned down a man in broad daylight who had come out of his car with a baseball bat to beat another man in a car vying for the same parking space. Palminteri never found out the reason for the killing, but he knew it wasn't about parking. "My father said it was about women or money," he says. "I mean, what else could it be?" The incident was a pivotal scene in the 1993 movie "A Bronx Tale," about Palminteri's life growing up around East 187th in the Belmont section of the Bronx. Robert De Niro directed and starred in it as Palminteri's father, Lorenzo, with Palminteri playing the gangster Sonny, who is an amalgam of three people, including that wise guy. Palminteri, now 56, adapted the film from his one-man play of the same name, which was a hit onstage in Los Angeles in 1989. He has since taken the play, with the 18 different characters he inhabits, to more than 30 cities, including an acclaimed Broadway run in 2007-08. It arrives at the Colonial Theatre in Boston on March 31. Calogero Lorenzo Palminteri - Calogero to friends and family, "C" to Sonny and his wise guys - moves like a don. He's an imposing man, almost 6 feet 4 inches, who walks with the commanding presence and ease of a creature at the top of the food chain. His eyes are of concern: dark, intimidating things. His face wasn't built for smiles, but the man turns out to be grand company and a marvelous raconteur. Palminteri also looks like a don: an arresting figure the day I met him in a long black leather coat, black cashmere turtleneck, black pants, and black shoes. He sports a red-tinted pair of sunglasses. He enters the Arthur Avenue Retail Market, an Italian souk of a place just off 187th, and glides past the hand-rolled cigars at La Casa Grande Tobacco, past Boiano's Food to Mike's Deli, famous for its "throwdown" eggplant parmigiana. He's on Calogero time, which means he's a half hour late for an interview in his old neighborhood. "Ah, Calogero!" exclaims a man named Guiseppe, who embraces him. 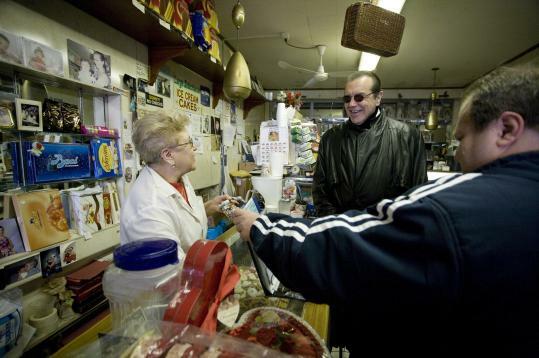 Mike Greco of Mike's Deli fame tells me in heavily accented English, "Before he was a big star, he was already a star. He's a good-looking guy. He still comes a couple of times a month and for Christmas and Easter." Then we're off for a trip back to his childhood. "It was a great neighborhood," says Palminteri. "It still is. Was there violence? Yes, but it wasn't a nightmare neighborhood." We're on East 187th now, and he points across the street to Our Lady of Mt. Carmel Church, where he was baptized and confirmed. He extends his arm expansively along the street and says, "This was my father's bus route - 187th. Then he got another route on Fordham Road." He leans against the stoop of his old apartment building door at 667 East 187th, a few doors down from the corner with Cambreleng. "A lot of guys hung out there," he says. "This was my life." Take Eddie Mush, a piece of work from the neighborhood. Palminteri tells me the guy was a loser's loser, a disaster in life and at the track. But he was captivating in his own weird way, so Palminteri brought him into the movie to play himself. It was a good idea. Eddie Mush aside, what he talks most about is his father. "My father's message to me was, 'You have to get out of here,' " he says. "Billy Bello was a fighter who died of a drug overdose on a roof. My father was really upset by that. He said to me, 'The saddest thing in the world is wasted talent.' That inspired me." Inspiration is one thing, success is another. Palminteri dropped in and out of Bronx Community College without a diploma. He crooned in a local band called RazzmaChazz and studied with Lee Strasberg. He went out to Los Angeles and was famously fired as a club bouncer when he denied entry to a man who turned out to be legendary agent Swifty Lazar. He eventually broke into small TV roles and movies and then scored in "A Bronx Tale," followed by Woody Allen's "Bullets Over Broadway," which earned him an Oscar nomination for best supporting actor, and "The Usual Suspects." "A Bronx Tale" is directed by Tony Award-winning director Jerry Zaks, who first saw the play in LA. He and Palminteri share the same agent, who put them together a couple of years ago. They clicked, and Zaks had agreed to direct the play by the end of the meeting. "Chazz is a joy to work with because he listens, he's unthreatened, he'll throw things out of the script he wrote," says Zaks. "I'd work with him again in a heartbeat." As for directing him, Zaks works around the edges. For example: "Chazz is used to doing this play as a younger man, full speed ahead. He didn't give himself the silences, the earned pauses. You hold for the laughs." Today, Palminteri, wife Gianna, and two kids, Dante and Gabriella, live in Bedford of all places, a haute WASP enclave north of the city that is home to Martha Stewart and a parliament of plutocrats. No eggplant parmigiana here. But Palminteri had seen Bedford from afar years before he moved there. "We were young guys from the Bronx," he says. "We used to drive out there and look at those houses and wonder who the hell lives here. Then you know what? One day I said to myself, 'I'm going to live here.' "
Palminteri brims with a self-confidence that stops just short of arrogance. "I always knew I was going to make it, without doubt," he says. "I've always been successful. Now I'm famous and successful." Some of this conviction springs from the coddled life of an Italian boy living with his parents: "My mother and father told me I was god. I was a good Italian boy who hung out with the same four guys. I was a little god." We walk on. People stare at him as they pass. They ask for and get autographs, cellphone pictures, conversation. So why, I ask him, was "A Bronx Tale" filmed in Queens rather than the neighborhood? "Here?" he replies incredulously. "We had to close off streets for two weeks. People here would never have stood for that [expletive]. Also, I didn't need too many partners, if you know what I mean." At the core of "A Bronx Tale" is Palminteri's father. "He was a good man who took care of his family," the son says. Sonny and his wise guys took the young Calogero to gamble at a racetrack. "My father found out about it and told Sonny, 'Don't ever take my son to the racetrack again.' Sonny liked my father, and he never did.
" 'A Bronx Tale' is about the working man. He's the tough guy," adds Palminteri. "I got tired of hearing all this [expletive] about the Mafia. Italian-Americans are not the Mafia. The Mafia is an aberration." Palminteri gets hungry so we stop by Zero Otto Nove, a restaurant owned by his friend Roberto. He orders pizza and some pasta for us. I pass. "Please let me put a little on your dish," he pleads. "Just a little, c'mon." At the end, he brings out his wallet but is blown off by the waiters. Palminteri cannot pay for a meal in these parts. Then one last stop - Gino's Pastry Shop. "It's the best cannoli you've ever eaten," says Palminteri. "I promise." It was. Jerome, who runs the store with his mother, Chiara, puts out the best cannoli this reporter has ever eaten, and I've lived in Italy twice. Jerome made an 18-layer wedding cake for the occasion of Palminteri's wedding to Gianna in 1992. It was so big that it couldn't get through the door to the reception room and the top layer fell off, so it ended up at 17. Jerome's got pictures. I ask Palminteri if he ever worries about being typecast as a heavy. Dumb question. This guy is an Italian-Zen master. "You know what?" he says. "I don't worry about that."